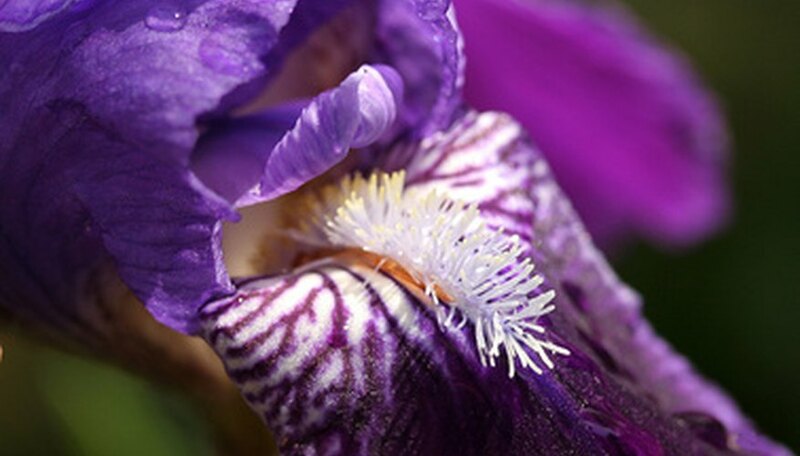 According to Deborah Brown of the University of Minnesota Extension, 300 species of iris exist in the world. All are perennial. Irises grow from bulbs or from rhizomes which are described as "thick fleshy roots" by Betty Wood of the American Iris Society. The most common types of iris in gardens are from rhizomes: German or bearded (Iris germanica), Siberian (Iris siberica) and Japanese (Iris ensata). Nurseries carry many varieties. Iris growing from rhizomes are bearded (meaning there are small hairs on the downward-facing petals or falls), beardless or crested, according to David Payne Joyce of Clark University. The tall German iris is the most well-known bearded type. Siberian and Japanese irises are beardless. Crested iris (Iris cristata) are rock garden or groundcover irises. Bulb types fall into categories as well: Dutch and English irises, the early-spring blooming Iris reticulata, and the Juno irises. The origin of the German or bearded iris is not definitively known; the USDA lists the Mediterranean as a probable location. Siberian and Japanese irises originate mostly in Asia. There are numerous hybrids of these types available, especially the bearded iris. Dutch and English irises are from Africa and Europe, Iris reticulata is from Turkey. Crested iris and other less commonly used irises such as blue flag (Iris versicolor) are native to North America. 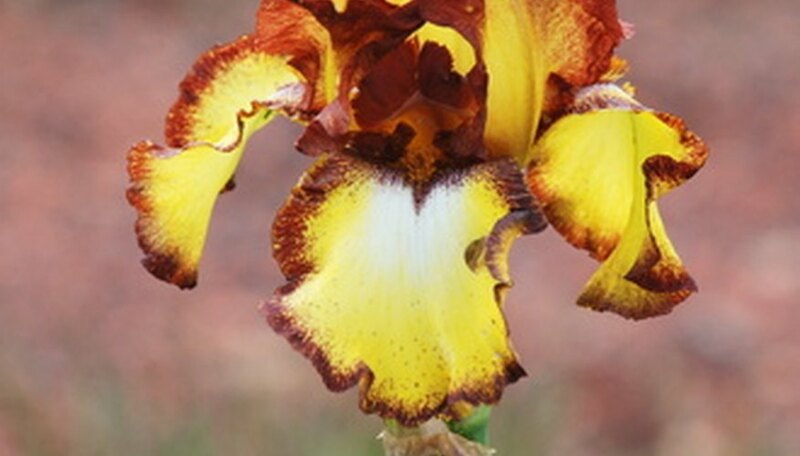 Bearded irises, according to the American Iris Society, are broken down into six sub-groups. Classification is based on the height of the flower stalks, along with flower size. Miniature dwarf bearded iris, for example, should have small flowers blooming on stems no more than 8 inches tall. Tall bearded irises have the largest flowers and the tallest stalks. Some bearded iris, such as Iris germanica "Immortality" bloom in spring and again in the fall. There are four types of beardless iris common to gardens, according to the American Iris Society. Siberian irises start blooming when the bearded irises are beginning to wane. 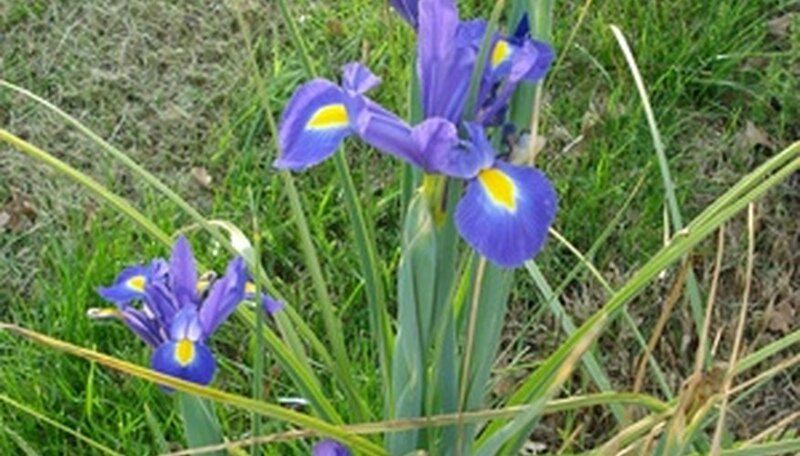 Their foliage is grasslike and flowers are less substantial than other irises. Colors are blue, purple and yellow. The showy blooms of the Japanese iris can be blue, purple, red and white, sometimes with darker veining. Spuria irises have orchid-like blooms and Louisiana iris flowers are colorful and open. Dutch iris may be perform better when planted each fall as annuals, as they are short-lived, according to the Missouri Botanic Garden. Iris reticulata bloom early in spring and may need to be replanted every year to fill in. Juno irises have a distinct foliage unlike other irises, in a pattern like that of corn. Most irises prefer full sun to part shade. Some irises, like the Japanese and the Siberian, prefer being moist. The Missouri Botanic German recommends planting them in a somewhat acidic soil. Bearded iris prefer well-drained soil, some moisture and not too much fertilizer, just a light dose in spring and after bloom. Bearded Irises do best in full sun. Crested iris can tolerate some shade. The bulb-type Irises may be planted in fall and like a well-drained soil as too much moisture can rot them. The biggest problems are iris borers and fungal leaf spot, especially with bearded iris. Cut out borer-damaged rhizomes and remove any foliage with leaf spot and dispose in trash. The Missouri Botanic Garden recommends keeping area free of debris and plant bearded iris in full sun. If planted too deeply, these iris will not bloom. Overcrowding of irises will hinder bloom as well.